Drummer, DJ, producer, culinary entrepreneur, New York Times best-selling author, and member of The Roots – Questlove, is the unmistakable heartbeat of Philadelphia’s most influential hip-hop group. He is the Musical Director for The Tonight Show Starring Jimmy Fallon, where his beloved Roots crew serves as house band. Drummer, DJ, producer, culinary entrepreneur, New York Times best-selling author, and member of The Roots – Questlove, is the unmistakable heartbeat of Philadelphia’s most influential hip-hop group. He is the Musical Director for The Tonight Show Starring Jimmy Fallon, where his beloved Roots crew serves as house band. Beyond that, this 4-time GRAMMY Award winning musician’s indisputable reputation has landed him musical directing positions with everyone from D’Angelo to Eminem to Jay-Z. 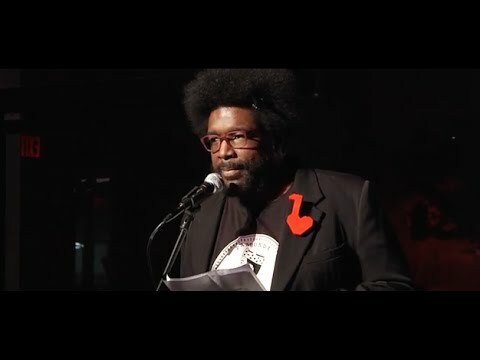 Questlove has also released two books including the New York Times Bestseller Mo’ Meta Blues and Soul Train: The Music, Dance and Style of a Generation. One of this latest endeavors includes scoring Chris Rock’s new film, Top Five, and also working as the music supervisor. Questlove is the Executive Producer of VH1’s Soundclash, hosted by Diplo and Executive Producer of VH1’s Philly 4th of July Jam. Questlove made his way into the culinary world with his signature “Love’s Drumstick.” Currently, Questlove is hosting a series of Food Salons with world-renowned and innovative chefs at his Financial District apartment in the NY by Gehry building. Questlove has appeared as a Guest Judge on Top Chef Season 11, his food and culinary endeavors have been featured on the cover of New York Magazine, in Food & Wine Magazine, Bon Appetit, and seen on The View, Watch What Happens Live, and Late Night with Jimmy Fallon. He is a Celebrity Ambassador for The Food Bank NYC, is on the City Harvest Food Council, a board member of Edible Schoolyard, and the first Artist-in-Residence at the Made in NY Media Center.